Pittsboro, North Carolina: Blue Bluer Books, 2018. Edition of 25 + 5 AP. 10.25 x 8.25". Dos-a-dos structure. Materials: paper, book board, book cloth, thread, ink. Letterpress and inkjet printed on Stonehenge, Red River, and Hiromi papers. . Bound in stiff paper boards with cloth spine. Signed and numbered by the artist. After is a dos-a-dos book with ghost images from the interleaving of an old art catalogue and other images of 'after"-ness, paired with a blackout poem. Josh Hockensmith: "After is about the life of the book in the digital age and the transitory nature of all things. It’s structured in two sections using a dos-a-dos binding. The first section features photos of ghostly afterimages left behind on the glassine sheets protecting plates in a 1929 art history catalog. The real world intrudes at the end of the first section when a thumb appears in the image. As the reader flips to the second side of the dos-a-dos, the imagery pivots to include afterimages of different kinds from the outside world. "The text in the book is a blackout poem I created using a sequence of poems by 15th-century Japanese Zen monk Ikkyu as the source text. The original sequence – titled Skeletons – is an extended exploration of the same transitory theme as After. I letterpress printed the Ikkyu poems in their entirety from polymer plates before creating the new, book-length blackout poem by brushing over certain words with a combination of sumi ink and gold calligraphy ink. "The English version of Skeletons is a translation by the great John Stevens, from Wild ways: Zen poems (Buffalo, NY: White Pine Press, 2003), used with the generous permission of the publisher. The book that I photographed the afterimages of artworks from is A catalogue of paintings in the collection of Jules S. Bache (New York: privately printed, 1929). 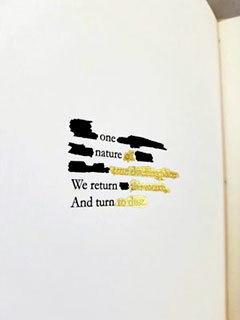 "I composed the blackout poem as an 'intentional' poem, but I use chance methods to determine which color ink to use when brushing words out: black or gold. For that, I use a printed sheet of randomized numbers between 1-4 that was created by John Cage and my mentor Stephen Addiss for a project they did together in the 1990’s. The numbers determine how many words I black out in one color before switching to the other. 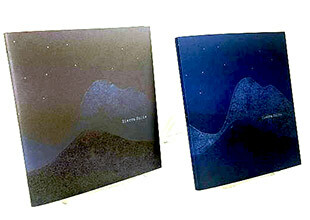 Each copy of the book has a different pattern of blackout coloration." Pittsboro, North Carolina: Blue Bluer Books, 2016. One-of-a-Kind. 16.25 x 13"; 8 pages. Brush calligraphy and sumi ink wash with gold ink detail, on heavy mulberry paper. Inkjet prints printed with an Epson SureColor P600 on Red River premium matte inkjet paper. Stab binding with sisal twine. Laid in four-flap portfolio with titles. Signed and dated by the artist. 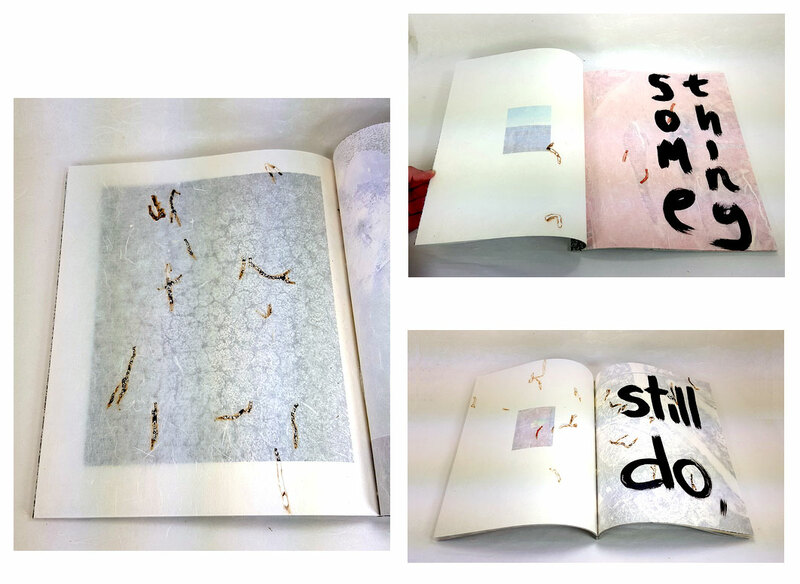 Josh Hockensmith: "names name no lasting name is a one-of-a-kind artist's book exploring the Taoist idea of the slipperiness of language, which informs a lot of my work. Each page-spread features a word in large brush calligraphy on the verso page, which I've burned away with an incense stick. The recto of each spread is a thick sumi ink wash, with flecks of gold ink handpainted to fill in the white gaps in the brush strokes. Each page also features a hidden printed image, nested inside the french-folded paper. "The theme of the inadequacy of language and its willful misuse seems to become more vital every day. To get a randomized cross section of words that were in the air when I was creating the book, I selected one word for each page by taking the first noun from a sequence of reader comments on the New York Times website. I created the hidden prints by doing a Google image search on each of the words, downloading the first result, and digitally manipulating it into a new image and print. 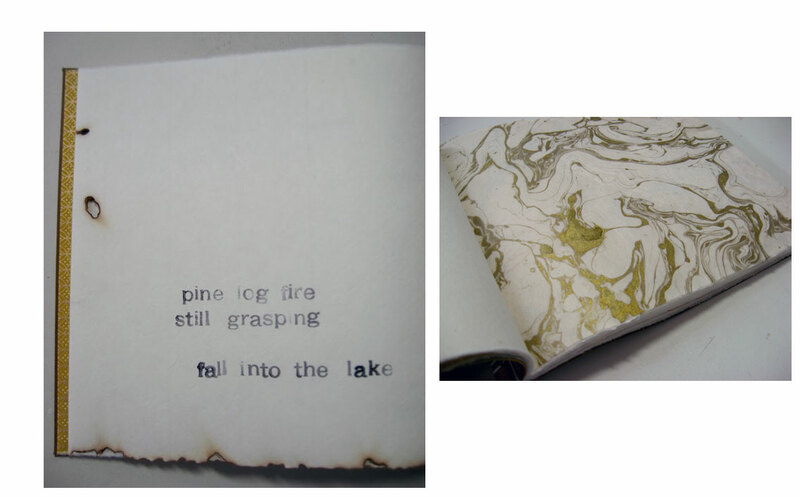 Parts of the prints show through on each page where the words have been burned away." Pittsboro, North Carolina: Blue Bluer Books, 2015. Edition of 100. 3 x 4"; 16 pages. Accordion fold. Printed with an Epson SureColor P600 on Hiromi kozo paper treated for archival inkjet printing. Embellished with burns. Laid in reused clear plastic cassette case. 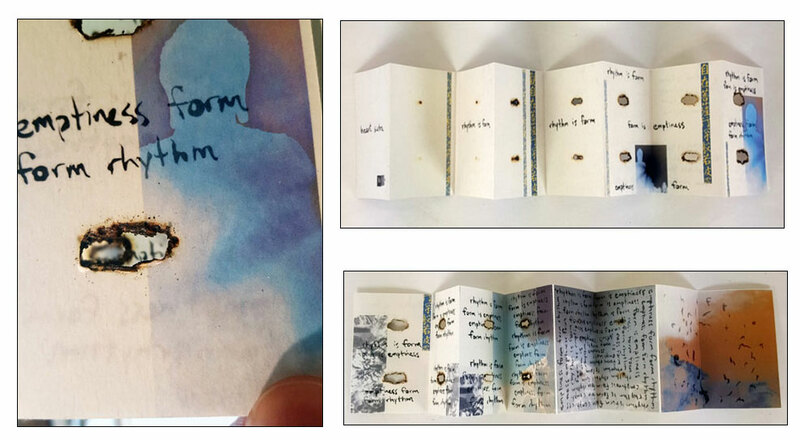 Josh Hockensmith: "heart sutra, remix is a handmade, accordion-fold artist's book inspired by one of the central texts of Mahayana Buddhism. 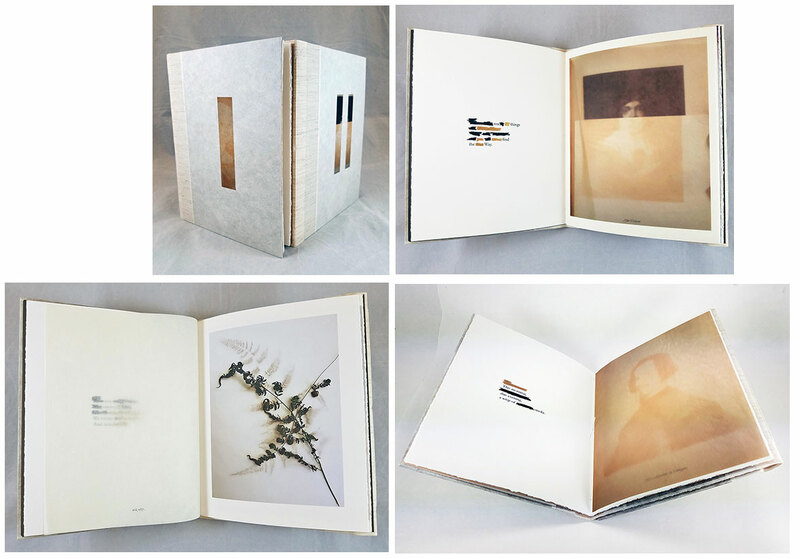 It features digital collage and a poem presented in brush calligraphy. 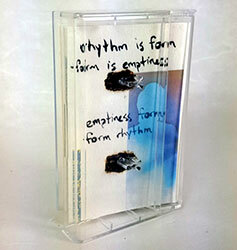 Each copy is inkjet printed, finished with unique burns through the pages, allowing it to fit snugly into a reused cassette case. "I composed the text for heart sutra, remix almost 20 years ago as an oral poem when I was first learning about the Heart Sutra. 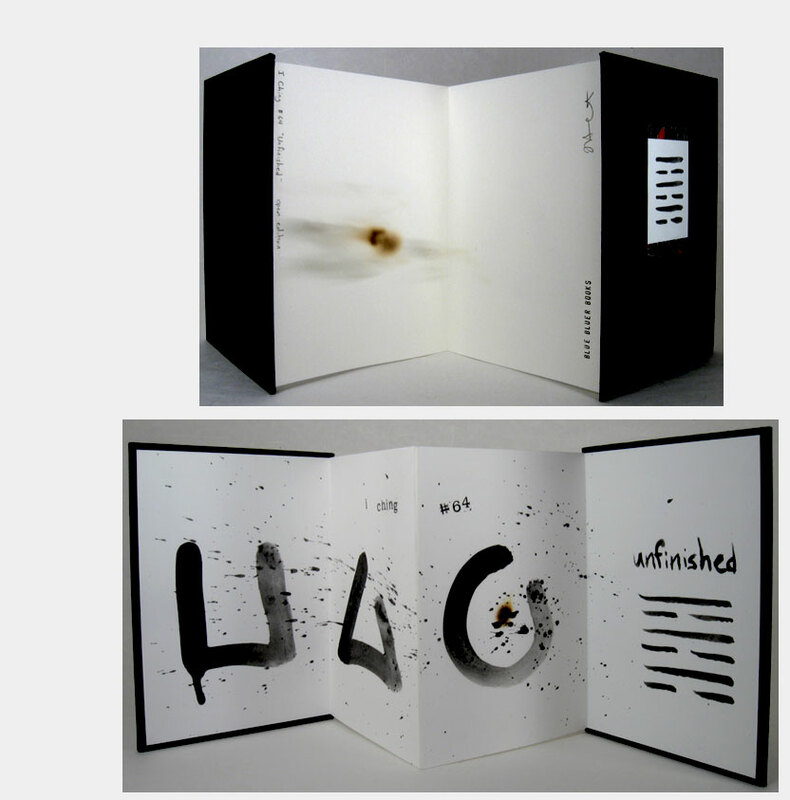 For this book version, I performed the calligraphy for each page spread ten times. After finishing the calligraphy, I scanned my favorite version of each page spread and used it as the basis for digital collage. "My poem and this book aren't meant to be a commentary or an expansion on the Heart Sutra, but rather an homage, an example of the long history of chanting and copying it in calligraphy as a devotional act." Pittsboro, North Carolina: Blue Bluer Books, 2014. Edition of 100. 4 x 6"; 48 pages. Inkjet printed on Red River 37 lb. Premium Matte paper with an Epson Stylus Photo 2200. Handbound with a hidden side sewing. Slipped into brown paper envelope with title and press information. Signed and numbered by the artist. "As a sometime Taoist and an all-the-time verbalist, I can't stop thinking about that line. "The book is introduced as 'A Glossary of Seventeen Terms Compiled to Vivify Your Miracle Practice.' The first entries are straightforward. Sacred terms from real-world religious traditions (caritas, paramita) mingle with new words for ideals that could benefit the world ('humilitocracy'). But as the book goes on, the system breaks down - terms grow more opaque or slippery, words are burned away on the page, and disturbing images start to invade. "Nothing about the book is what it seems. What looks like a stack of smudged index cards rubber-banded together is a carefully printed, hand-bound book, its higher aspirations muddied by the inability of names to name a lasting name." Chapel Hill, North Carolina: Blue Bluer Books, 2013. Edition of 100. 5.5 x 8.5"; 20 pages. 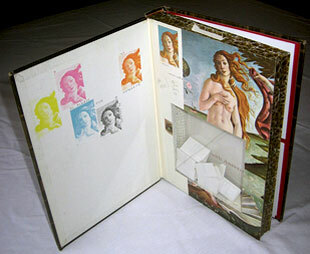 Facsimile edition of an altered book. Commercial digital press. Saddle-stitch binding. Opens in traditional Chinese style from right to left. Slipped in brown envelope with paper title label. Josh Hockensmith: "Doctor Mister Miracles (a.k.a. Mr. Miracles; Miracle Man) is a round little enigma in a suspiciously familiar hat which shall not be named for fear of prosecution. He shows up periodically to embody my own and readers' inchoate ambitions and devilishly mischievous tendencies. He has trampled cities, journeyed to the afterlife and back, delivered a commencement address that he borrowed from a more famous author (with the author's generous permission), and rescued a clinically dead river through his avatars on Earth. 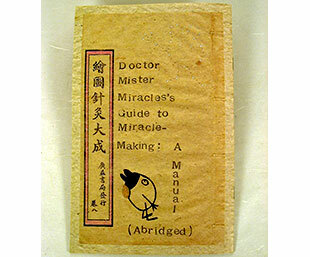 "In Doctor Mister Miracles’ Guide to Miracle-Making, he partially interprets a Chinese text into Enochian, the language of the angels discovered in the 17th century by English naturalist/miraclist, John Dee. I've partially translated the Enochian in turn (with the benefit of those with no knowledge of the language) into English. Chapel Hill, North Carolina: Blue Bluer Books, 2011. 9 x 7"; 48 pages. Rubber-stamp type and inkpad. Japanese stab binding. Handwritten pages written by Addiss. 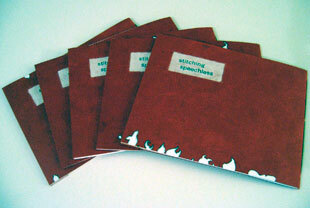 Rubber-stamped pages stamped by Hockensmith. Burning and binding by Hockensmith. 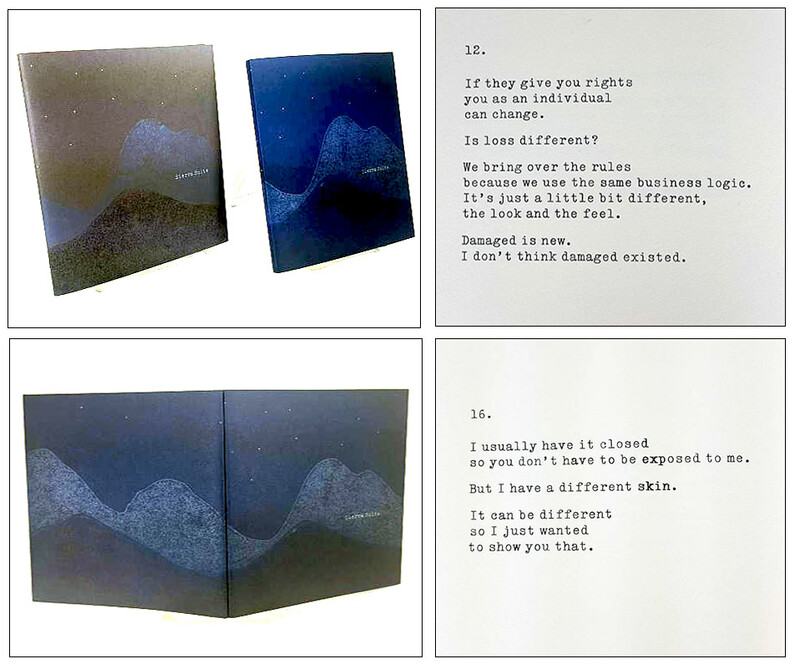 Blue Bluer Books: "At the heart of stitching speechless are 17 haiku by prominent Zen art scholar Stephen Addiss – who studied and collaborated with John Cage, the experimental composer and artist – used chance methods to create the haiku. He cut his own poems into individual lines and reassembled them into new poems, each one full of surprises. Some make perfect sense while others are more absurd. 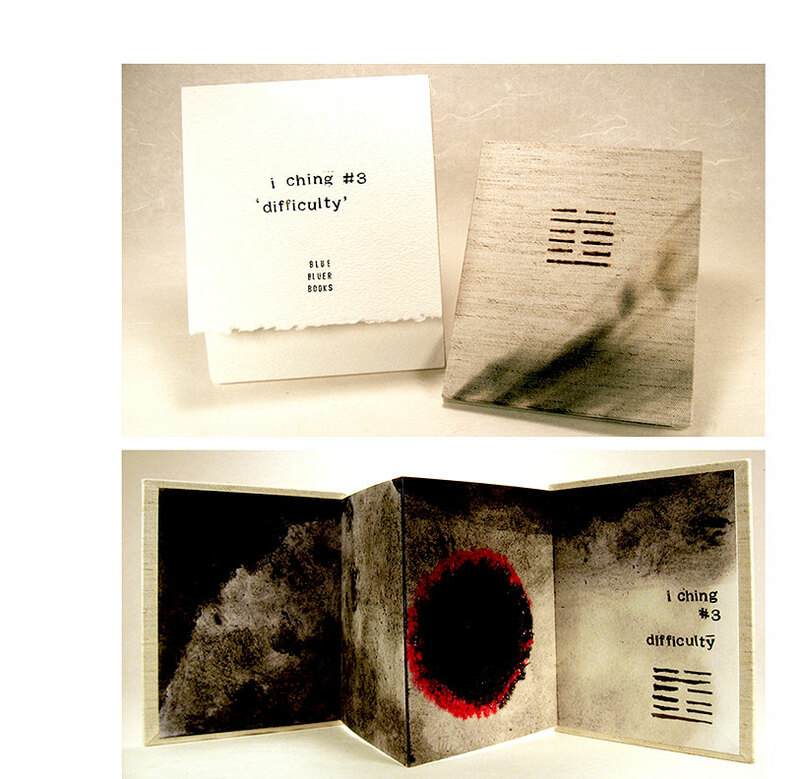 "stitching speechless ... celebrates Addiss' work and the intertwined histories of haiku, Zen, and book arts. 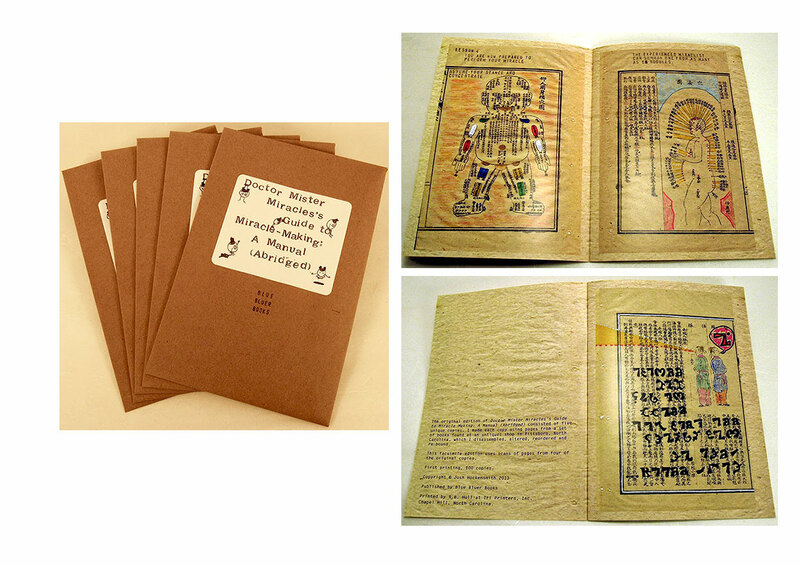 The deluxe edition incorporates fine Japanese materials and bookbinding techniques in honor of haiku's origins. The burned and smoked pages acknowledge Cage's influence. To determine the placement of each burn, Hockensmith used a sequence of randomized numbers that Cage and Addiss once created for their own projects. 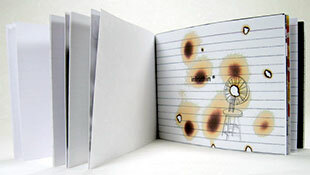 The method of printing ... is inspired by lo-fi tradition in book arts – the world of 'zines and democratic multiples. "Hockensmith was a student when he first met Addiss. The two have now worked together for 18 years. 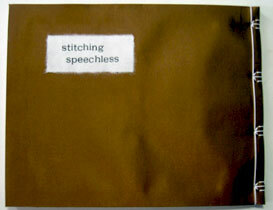 stitching speechless is their second artist's book collaboration." Chapel Hill, North Carolina: Blue Bluer Books, 2011. Facsimile Open Edition. 9 x 7"; 48 pages. Produced with a commercial printer. Rebound in handmade wraparound cover. 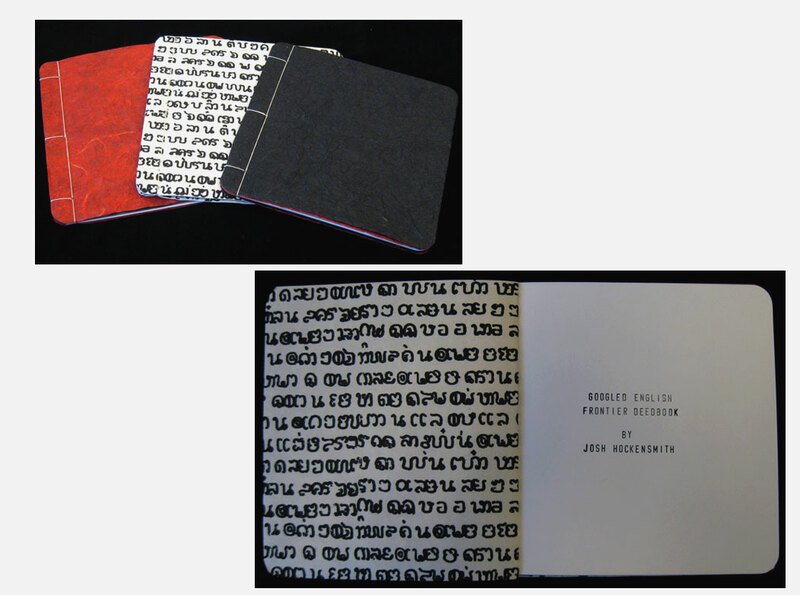 Blue Bluer Press: "The facsimile edition takes stitching speechless further into the vein of democratic multiples, while maintaining a handmade touch. Hockensmith produces this open edition through a commercial printer and then trims and rebind each copy with a handmade wraparound cover." Josh Hockensmith, Blue Bluer Books: "Each book in the I Ching series will be a visual meditation on one of the sixty-four entries in the Chinese wisdom book known as the Book of Change. 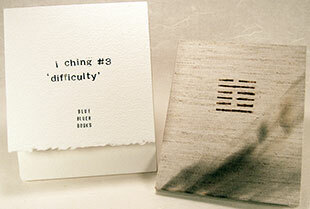 "When doing a reading from the I Ching, the reader makes a randomized selection of two symbols called trigrams. There are eight trigrams to select from, meaning that there is a total of sixty-four combinations –-or 'hexagrams' – that may result. "Each trigram combines yin and yang elements to represent different ideas – Sky, Lake, Thunder, Fire, Earth, Mountain, Water, and Wind. The hexagrams formed by the combination of these symbols have a range of traditional interpretations. I'm fascinated by the combination of mysticism and practical, philosophical analysis the I Ching represents – especially the value it places on chance in evaluating one's actions and fate." Chapel Hill, North Carolina: Blue Bluer Books, 2013. Open Edition. 77" x 5.25"; 4 pages. Accordion structure. Inkjet printed with an Epson R2200 on Moab paper. 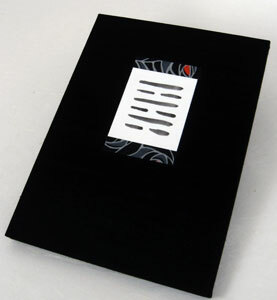 Bound in black cloth-covered boards with collage title illustration on front cover. 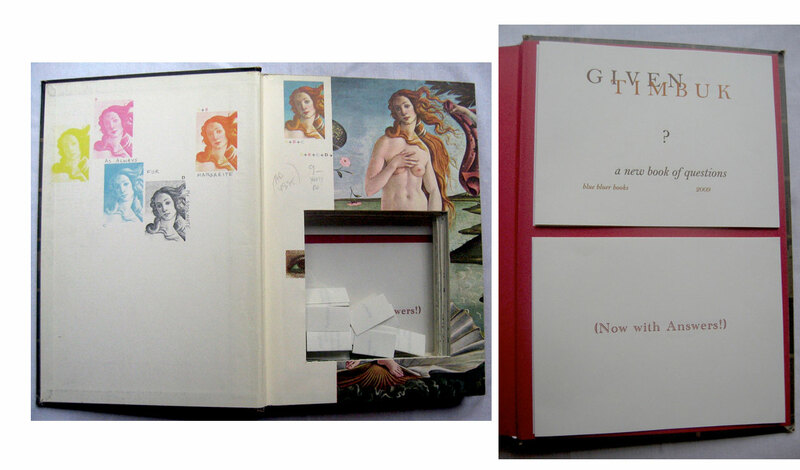 In paper slipcase with title label on side inserted into four corner picture slots. 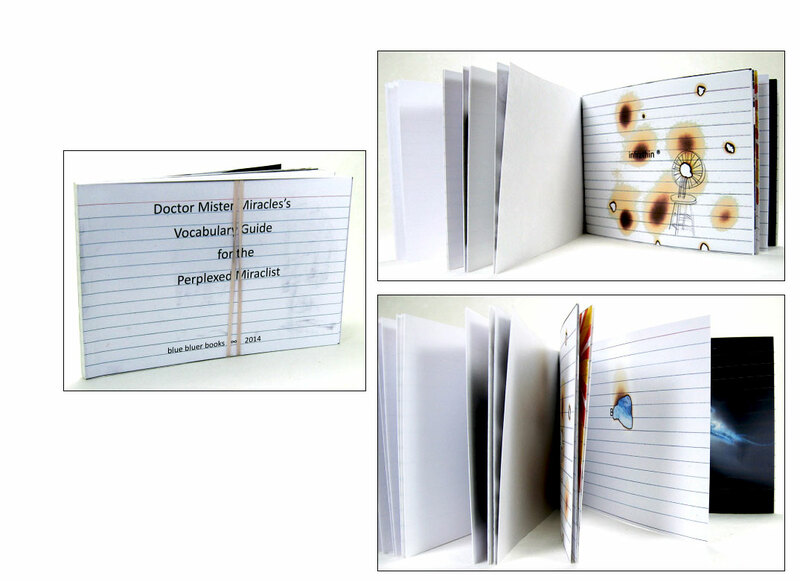 Each copy has unique burn/smoke marks made with matches and incense. Signed by the artist. "Other translations of the hexagram include 'Not yet forded,' and 'Before completion.' It can be read as an encouraging sign that the successful achievement of a goal is in sight, or alternatively as a warning not to lose focus when something is nearly finished - perseverance is needed to see it through successfully to the end." Chapel Hill, North Carolina: Blue Bluer Books, 2009. One-of-a-Kind. 7.5 x 10.25 x 1.25"; altered book. Inkjet printed on Mohawk Superfine text weight. Two accordion-fold pamphlets (each 9 pages) attached to the back board feature questions and answers from the project. The text block of Marshall Lee's 1965 textbook has been consolidated and hollowed out, forming a container for new questions and answers to be added. Blank slips of paper and pencils provided for readers to contribute. Josh Hockensmith: "I started the Given Timbuk project after reading Pablo Neruda's' Book of questions. Neruda's question-poems ask the unanswer-able, and provoke lightning-quick glimpses of another possible order of reality. After reading them, I couldn't help but start to write my own question-poems. Eventually I began adding answers – not to the questions themselves, but rather hints from the world that there might be small answers here and there. "Given Timbuk #1 is the first artist's book based on the project. It's an altered book made from a copy of Marshall Lee's 1965 textbook, Bookmaking: The illustrated guide to design and production. Two accordion-fold pamphlets attached to the back board feature questions and answers from the project. 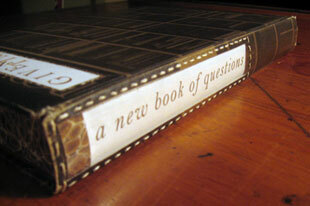 The text block has been consolidated and hollowed out, forming a container for new questions and answers to be added. When displaying the book, I provide blank slips of paper and pencils for readers to contribute. 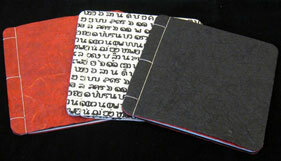 "Given Timbuk #1 debuted at 2009 BookOpolis at Asheville [NC] BookWorks, and the interactive element was a big hit. By the end of opening night, the book was stuffed with readers' thoughts. I've been sharing the contributions on my blog . If the new owner displays the book in the future, I'd like to continue to gather contributions". Neruda's Book of questions included: "Tell me, is the rose naked / Or is that her only dress?" Hockensmith's readers have posed the following: "What is the speed of dark?" and "How many more miles?" Chapel Hill, North Carolina: Blue Bluer Books, 2008. Edition of 30. 5.5 x 5.5"; 20 pages. Printed on archival papers. Hand-stamped text using hand-set rubber type. Bound in Japanese side-sewn style traditionally used for ledgers and account books. Available with red, black, or black and white script covers. Josh Hockensmith: "Googled English Frontier books consist of 2- and 3-word combinations that bring up no results when searched on Google. • Each word in the combination must bring up Google search results when searched by itself. • No proper nouns; no foreign words unless they've been adopted into English usage; no consulting the dictionary. • No quotation marks around the phrases, in order to cast as broad a search as possible. "Own a piece of virgin linguistic territory while it lasts. Each book contains 10 of the word combinations turned up by the project, stamped on a variety of weighty, archival papers." 7" x 5.25"; 4 pages. Accordion structure. Inkjet printed with an Epson R2200 on Moab paper. 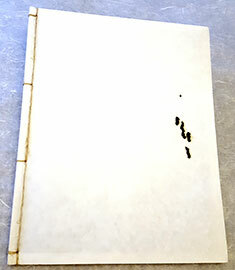 Bound in cream cloth-covered boards with burn makings created with soldering iron and matches. In paper slipcase with title on front flap. Signed by the artist. Josh Hockensmith: “This is the second book I've completed in the I Ching series. Like I Ching #64: Unfinished, this one is also based on a sumi-e original that I then scanned and made archival inkjet prints of. 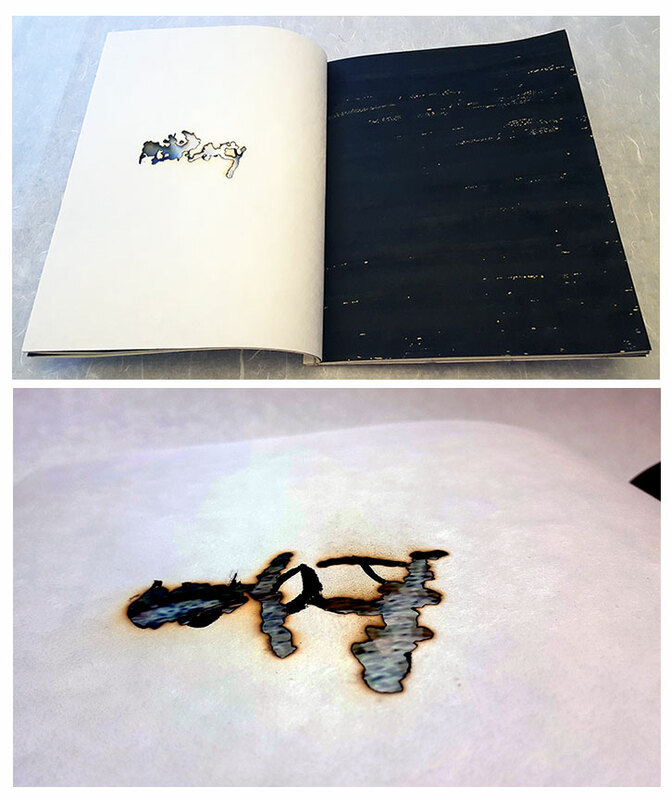 The covers of each copy are decorated with unique burn and smoke marks, as well as some work done with a soldering iron." Pittsboro, North Carolina: Blue Bluer Books, 2017. Edition of 10. 5.5 x 6"; 24 pages. Text handset in 12-point Typewriter & 10-point Caslon type and letterpress printed onto Rives heavyweight paper using a Vandercook SP-15 proof press. Two-sewn-as-one pamphlet binding. Letterpress-printed covers, featuring a relief print from a carved piece of Davey book board. Signed and numbered by the artist. Josh Hockensmith: "'Sierra Suite' is a chapbook of 'found oral' poems I composed during a training session at the library where I work. We were being trained to use a new software called Sierra, and I was struck by how much of the presenter's language was about authority and control, who grants you the rights to do things in a digital environment, and how we present ourselves more generally. Taken out of context, her words resonated with me. "While this is a straightforward poetry chapbook, I consider it an artist's book project because I intend to produce other editions of the poems in radically different formats, as an exploration of how different physical presentations of identical poems can affect their reading and reception." Chapel Hill, North Carolina: Blue Bluer Books, 2013. Edition of 20. 5.25 x 8"; 14 pages. Digital collage. Printed on color laser printer. Pamphlet style binding. Each copy with unique cover made from an altered magazine page or cover. Signed and numbered by the artist. Josh Hockensmith, blog August 20, 2013: "I decided to continue a series I started with last year's Surf book #1/#2. Instead of a one-of-a-kind book this time, I produced 20 copies of an 18-page visual poem made up of collaged photos from surf magazines. 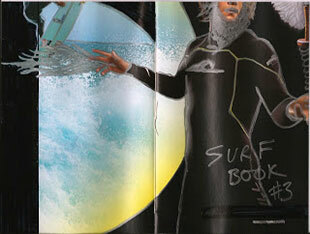 It's called, creatively enough, Surf book #3 (Get Barrelled). No text--just images I created by tearing photos out of surf magazines using a piece of packing tape. “Once I'd created and scanned the collages, I had the pages printed from PDF at Kinko's on a color laser printer/copier. A title strip copied from the internal collage, glued onto the cover paper… . Compared to the cut-up collages inside the book, which sample from the best and worst of surfing's visual culture, it was staid and out of character. 11 x 13"; 14 pages. Brush calligraphy. Inkjet printed images. Burn marks. Semi-translucent washi paper. Stab binding. Signed and dated by the artist. 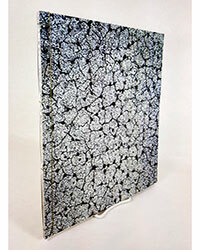 Josh Hockensmith: "Nested inside the folded, double leaves of each page is an obscured image. Each recto image is a Google Maps screen capture of the site of a major environmental catastrophe, manipulated in Photoshop to create a full-bleed abstract image in unnatural colors. Pictured sites include Three Mile Island; Picher, Oklahoma; Bhopal, India, and others. Each verso image is a smaller, casual snapshot of some minor natural beauty. I burned the pages with a soldering iron, each page featuring one more burn than the previous one had. "When I originally formulated the text, I thought the book would be a broad, ironic look at the universal human tendency toward nostalgia. Instead, it became a more pointed record of amassed environmental degradation." Text: "we had / something / beautiful / and we / still do / don't we?"